I give lectures to a thousand people at a time. One walks out and says, ‘I’m going to change my life.” Another walks out with a yawn and says, “I’ve heard all this stuff before.” Why is that? 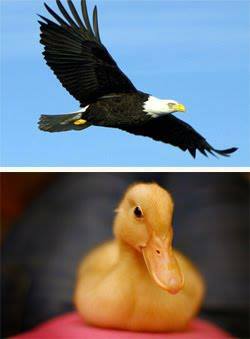 Chalk it up to mysteries of the mind and don’t waste your time trying to turn ducks into eagles. Look for and find people who already have the motivation and drive to be eagles and then just let them soar.